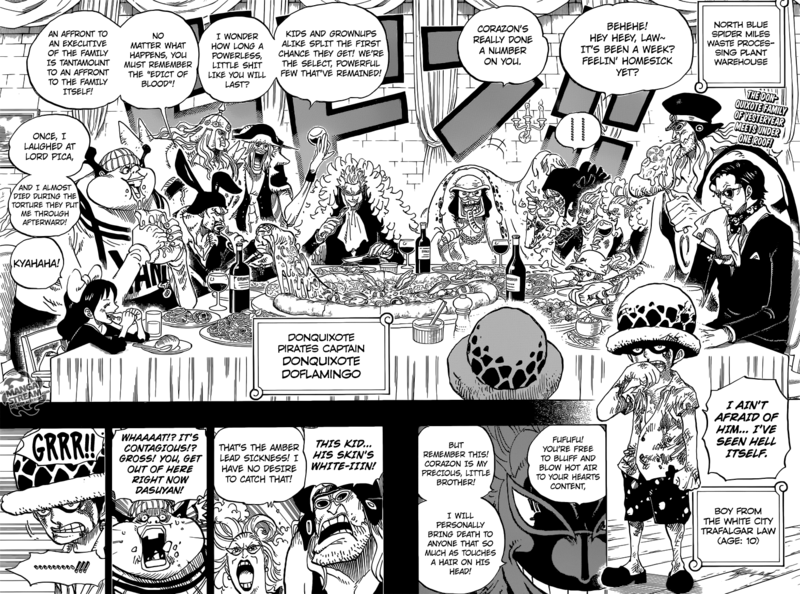 We flashback to the past with the Donquixote Pirates dining together. They discuss Law’s beaten by the hands of Corazon. Machvise and Jora then point out Law’s illness, “the Amber Lead Syndrome“. Doflamingo slams his hand down stating that Amber Lead Syndrome is a “poisoning” and not a disease that could be spread. Doflamingo asks Law “what he hates so much“, and Law replies “that he does not believe anything“, swearing to take “revenge” on Corazon for throwing him out the window. Baby 5 asks Gladius about the “White City“. He tells her about Flevance, “all the citizens were wealthy and the city was so beautiful it seemed like out of a fairy tale“. The source of all this wealth was “Amber Lead“, it was highly valued resulting in a “bottomless money source“. Gladius and Lao G state that for “100 years, the World Government and the king of Flevance knew the truth about amber lead nearly a century before it was even mined: it was poisonous to handle“. They kept this a secret to maintain their source of wealth fortune from the amber lead. The poison was “slow acting”, with “each generation that was born with Amber Lead Poisoning had shorter lifespans than the previous generation”. As a result of a “generation gap” in poisoning symptoms, everyone came down with illness simultaneously. People began dying very quickly, and were quarantined by neighboring countries. The World Government saved the royal family, abandoning the civilians. Many of the civilians were shot out of fear if they attempted to seek help from neighboring countries. Flevance eventually ended up going to war with the neighboring countries. The children were evacuated, but Law refused to leave his sister Lamy. Law’s father failed to convince the World Government to “tell the truth” about the illness being “non-contagious nature of Amber Lead Poisoning“. Law while visiting his sister hears gunfire outside. Law heads outside only to find “his parents, the nun, and all the children shot down” by an invading army . Law began cry as the army burns down the hospital with his sister inside. Senor Pink says “that after going through such an ordeal at the age of ten, it’s no wonder that Law’s personality is messed up“. Meanwhile, Law locates Corazon and reveals a sword and says he has “no right to live since his parents and sister died“. Law stabs him in the back, Buffalo races to tell Doflamingo, who is currently sleeping. The back story of Law was touching and sad. It was surprising that Law now seems so well adjusted considering hi childhood. Considering the fact that Doflamingo said he killed his brother Corazon he can’t die now. I’m interested in seeing why Doflamingo kills his brother and how the “family” reacts. 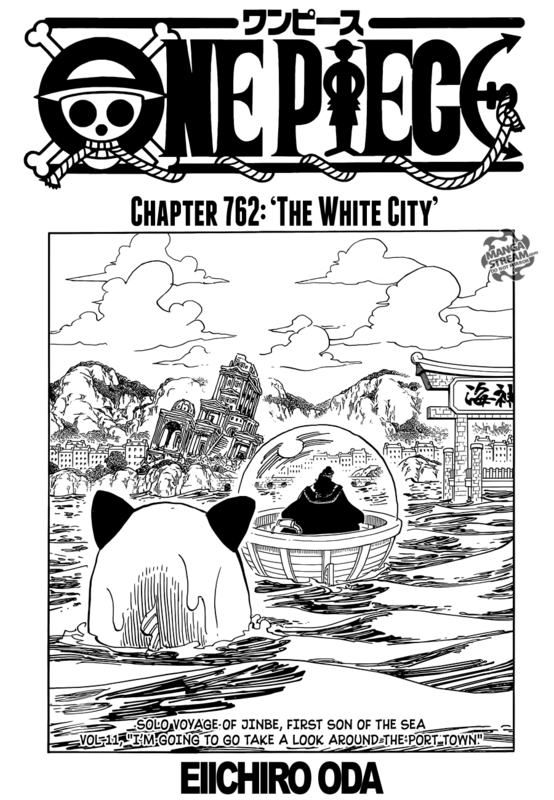 The chapter begins with Sasuke and Naruto atop the Valley of the End. Sasuke explains his version of “what the Hokage is and should be doing“. He alludes to Itachi and how he was cast out of Konoha for killing his clan. The village created a “framework” in ordered to keep peace and structure in the world. Itachi was used to maintain this framework. Itachi slipped into the darkness and become a traitor and a criminal to the rest of the world. He took all the hate and pain to keep the Fire Country and the leaf village safe. Due to this Sasuke considers Itachi to be, “the True Hokage“. Sasuke states that the title is “more fitting for someone who is willing to accept grudges and hatred of everyone and bear them all“. He says he also “realized how strongly Itachi felt towards his country and village that he would go far to protect them“. He said “Itachi made a mistake by letting him live” because he “became decentralized and dispersed away from him“. He would instead “shoulder the burden of hatred all by himself“. He will rule the ninja world “by making all the decisions and judgments without care of what the people feel“. He will “focus the hatred of the people on himself and unify the villages by doing so“. The “Sage of the Six Paths” remembers what Sasuke told him what his “idea of Hokage is“. 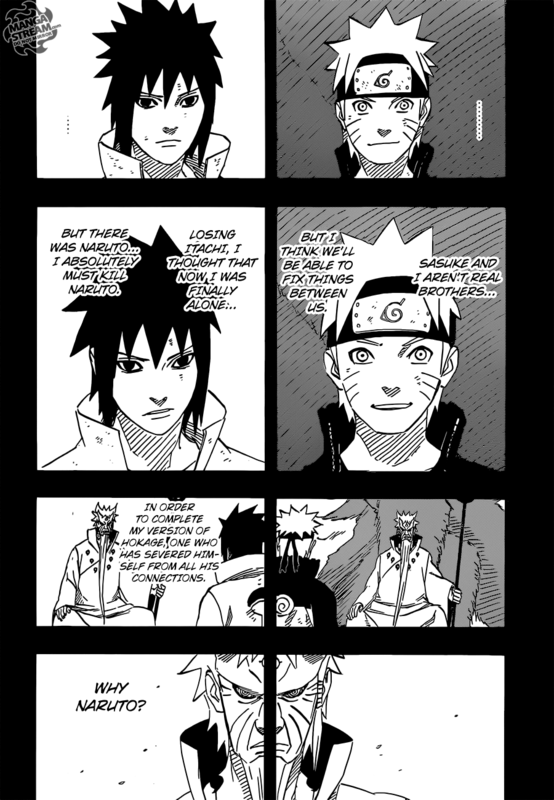 Naruto tells Sasuke that “his plan wouldn’t work since the people wouldn’t allow that to happen“. Sasuke says it “doesn’t matter” as he’s the “only one with the power to take control“. Naruto flashes back to his conversation with Itachi, as he tells Naruto that “taking the burden of hate on your own is the reason why people like Madara turned out the way they did“. He also says “that you need friends, family, comrades to help shoulder everything because if you don’t you will surely fail“. Itachi tried to do everything by himself and that is why he failed in protecting the village. Naruto then tells Sasuke that “if he believes that’s what Itachi would have wanted he didn’t understand what his brother wanted“. Sasuke recalls Itachi’s words during their fight with Kabuto and that he said a similar thing to him. Naruto says that “Sasuke is just going to kill the Kages and the Tailed Beasts“, with Sasuke saying that he’s going to “sever the past“. Naruto says that he can’t get rid of Itachi’s memory like that but Sasuke says he can and that he has. Itachi is nothing but the past now. And that the only thing left to sever from the past is Naruto. 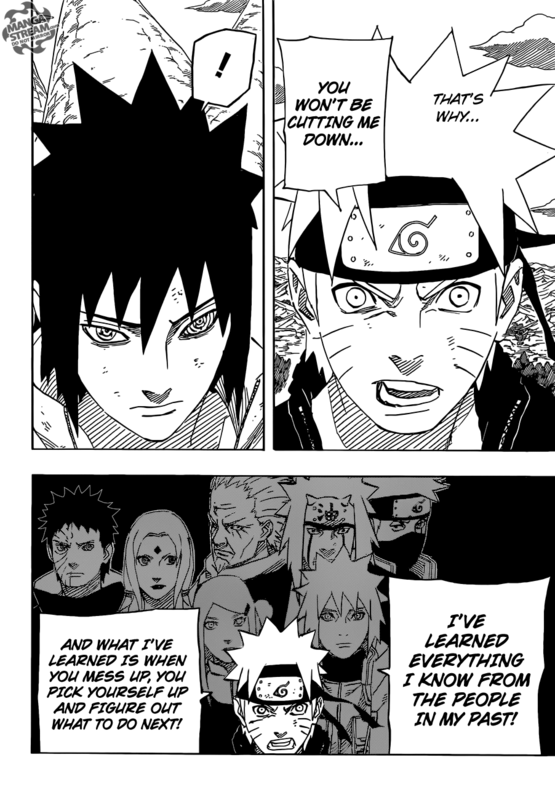 Naruto argues that “everything he learned is from his past and that when you mess up you move on and figure out what to do next, not wipe the past clean but learn from it“. The Sage informs Kakashi that “he will be leaving soon and that the only thing he can do is leave it up to Naruto and Sasuke and believe everything will turn out ok“. The Sage recalls the conversation he had with both of them, Sasuke says that to complete “his idea of Hokage he must kill Naruto because his is the closest thing to a friend he has ever had“. 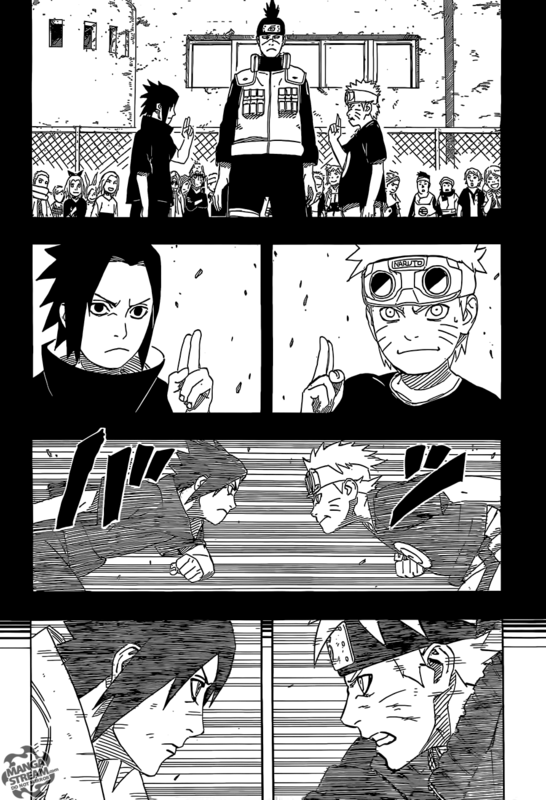 The chapter closes with Naruto and Sasuke charging at each other. The philosophy of Sasuke was somewhat confusing. I think I got most of what he was saying but I’m still confused. Naruto philosophy hasn’t changed. Unlike Sasuke Naruto has always been consistent with his views what being Hokage meant. 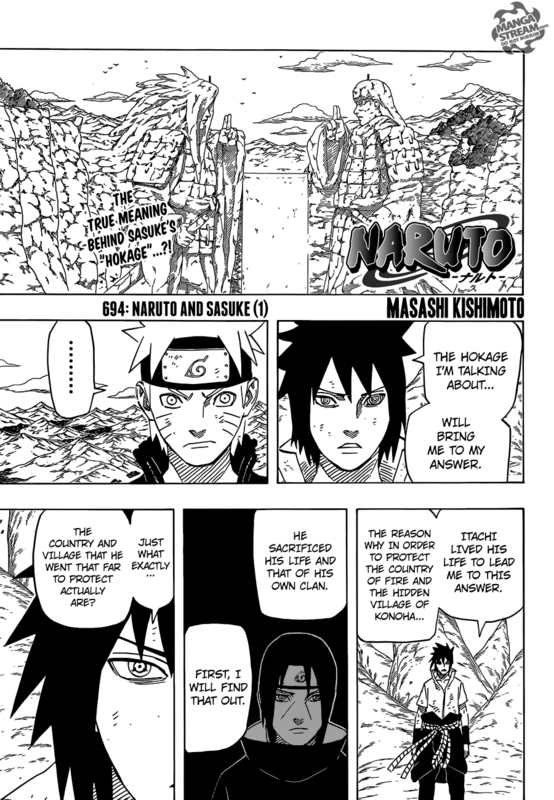 Personally, I think Kishimoto put some theory together just so Sasuke has something to contrast himself with Naruto. Whatever, I guess that battle is the only thing that matters. I hoping that this is the fight that the battle between Kaguya and Naruto and Sasuke wasn’t. Senjumaru states that “now that she think about it”, “we were on the topic of”. She says she “forgets to remove the needles after tailoring would be an incurable vice of mine” and she apologizes. 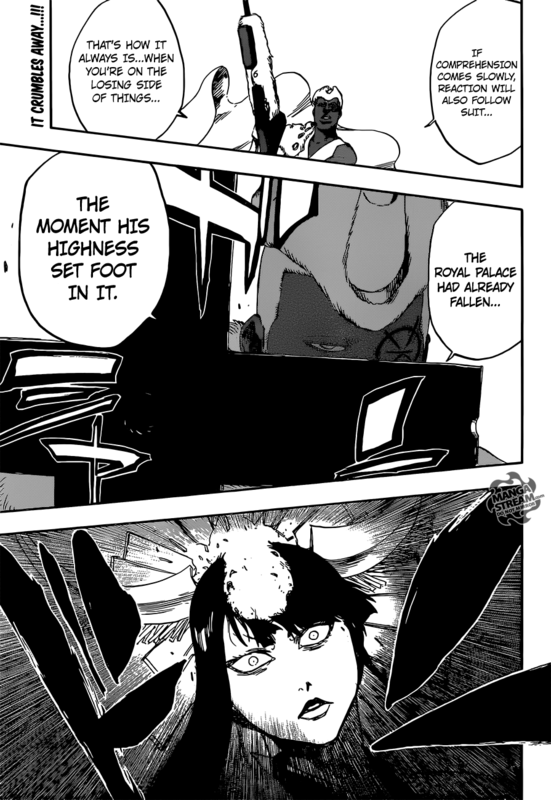 She turns to Yhwach stating “that their blades should be able to reach him now”. He responds “is that what you truly believe” then he summons several Soldat from his shadow. 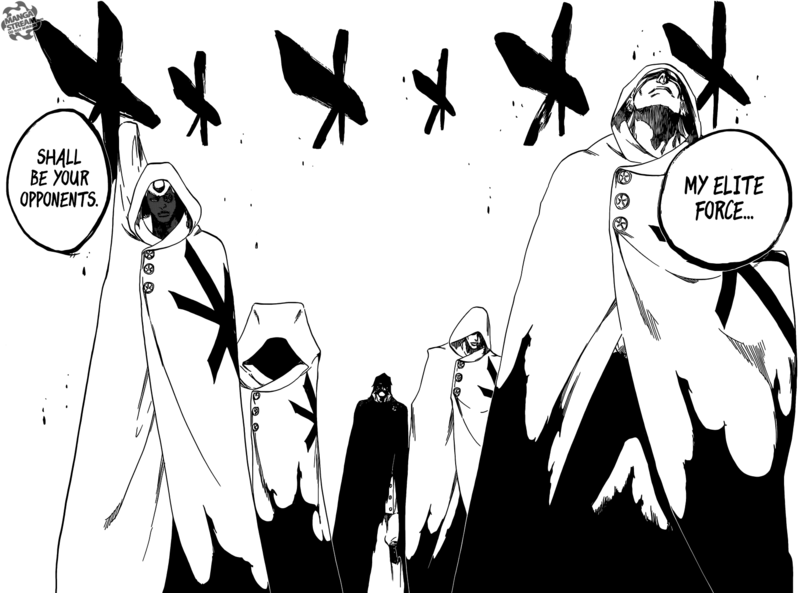 Yhwach says that “if the likes of the soul king warrior’s are the adversaries, my Soldat are more than enough”. He then summoning four elite Sternritter to take on Senjumaru, Sternritter Letter M – The Miracle Gerard Valkyrie, Sternritter Letter X /X-Alias Lille Barro, Sternritter Letter C – Compulsory Pernida Parnkgjas and Sternritter Letter D The Death Dealer Askin Nakk Le Vaar. Askin acknowledges that he was the “only one to be the only one who was promoted from below”. Gerard promising “to cut Askin down”if he gets in the way before attacking Senjumaru, who blocks with her needle. He easily destroys her needle an claims that her “delicate, feminine arms can’t halt my blade”. She calls for her “minions” in particular the “shield of the soul king”. Pernida attempts to “say” something and “crushes” the giant. Lille makes a comment about Senjumaru “entertaining the possibility that the royal palace would, perhaps fall”. He says that if “comprehension come slowly, reaction will also follow suit”, and that “the royal palace had already fallen, the moment his highness set foot in it”. He then takes out hi rifle and shoots Senjumaru in the head. There’s no way that Senjumaru is dead, but thing aren’t looking good. While, I predicted that Yhwach would release more sternritters. I’m hoping that this is it for the sternritter reveal. Pernida seems like an interesting character and I wonder what his power really is and of course the others. 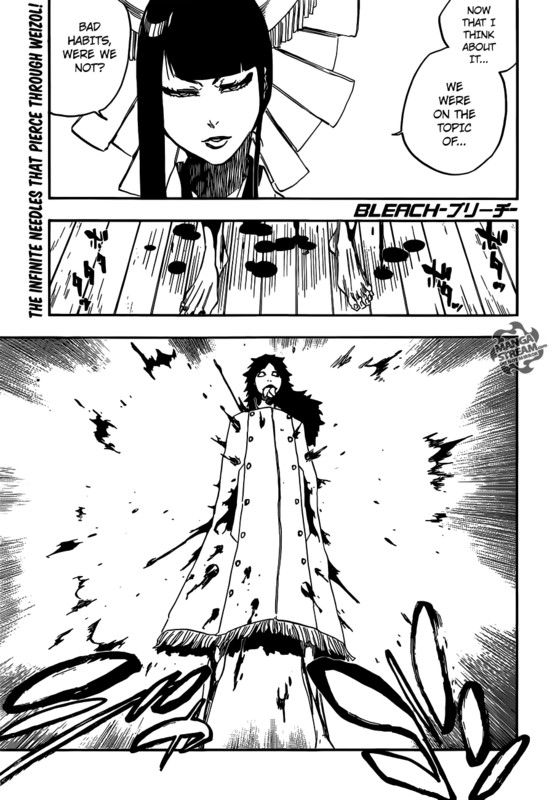 I’m hoping that Senjumaru puts up a better fight and I can’t wait to see what her Bankai is like. I don’t follow Naruto, but it sounds like the writer is just printing gibberish to justify a battle between Naruto and Sasuke.